Want to drive a historic race car on the Goodwood track? You can! So you’ve been to Goodwood Revival, or lapped up the TV coverage, and of course you’ve loved it. And if you were there in period dress, you’ve truly been part of it already. But how about really living the experience? How about trying a few of the cars on track? Well that’s now possible, with Goodwood offering corporate track experiences in a variety of historic race cars. Participants on one of these new Goodwood Revival Experience days get to try several (typically eight) very different cars, with instructors sat alongside. This seems quite an opportunity, and we were keen to try it out. The days are run by Goodwood’s Ultimate Driving chief instructor David Brise, not only a driver of some repute, but of the same family that gave us Formula 1 star Tony Brise (sadly killed in the same plane crash that ended Graham Hill’s life), and Tony’s father John Brise, multiple World Stock Car Championship winner. Crucially, all have full rollcages and harnesses, and all but the Jaguar Mk2 are on race rubber, Avon CR6ZZs. Mostly, the engines have simply been detuned a little for improved longevity and driveability – as much fun as it sounds to be revving a 1960s engine to 8000rpm, that would result in little or no power below 5000rpm, and an engine life of just a few of these corporate days. To further ensure longevity, the engines are fitted with electronic revlimiters, set 1000rpm below the ideal redline for each car. That means that even if someone changes down too soon, which the revlimiter can’t protect against, it’s still unlikely that the mistake will result in mechanical catastrophe. The downside is that most of these engines hit their limiters at a relatively low 5000rpm, but it’s a fair price to pay for the privilege of driving such valuable machinery, and higher gearing is being investigated for some of the cars. The price for these corporate sessions start at £12,400 for a half day with a group of 12, up to £20,000 for a full day with a group of 20. Understandably pricey, given that every car has its own dedicated instructor, and every car is valuable and requires meticulous maintenance and preparation. He’s not wrong. It sounds sweet even as we sit in the pitlane awaiting the first session. It’s a gorgeous day, the track is dry and the Alfa feels ready and willing, though in typical Italian style it’s a bit of a stretch to the steering wheel even with the seat set slightly too close for leg comfort – a feeling accentuated by being held in tight by the race harness. The gearstick is long, the shift equally so, but the controls are light, and the engine is tractable enough to make a sharp exit onto the circuit a cinch. There’s no-one else on track yet, so straight over to the left side of the track and then into the first corner, Madgwick, with its double apex – generally it’s best not to bother getting too close to the first apex but concentrate on getting the second apex correct for a fast exit towards Fordwater. 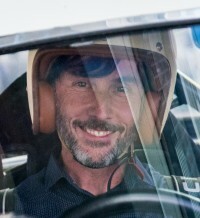 My instructor calmly points out braking points, doesn’t cringe when I miss third gear– the change is not just long but a bit rubbery, and it takes some getting used to – and suggests a gentle lift for the usually flat-out Fordwater while the tyres are still cold. Then it’s into St Mary’s, which is so satisfying when tackled correctly, but in this case I’m still battling the gearchange, and down to Lavant for a long smooth turn out onto the Lavant Straight. The Alfa’s steering is light, and although there’s a little bit of play (as is typical of these Alfas) it still feels precise, aided and abetted by wonderfully taut suspension. Down Madgwick straight, a long stretch to persuade the stick into fifth (I heard someone comment later that fifth was ‘virtually between the instructor’s legs!’) and we probably hit 90-100mph before the revlimiter and the rapidly approaching trickiness of Woodcote end the fun. Brake hard, because Woodcote’s double-apex is harder than it looks, a quick squirt up to the chicane, brake hard again, right-left through the chicane, and past the pits for another lap. After a few more laps, confidence is up, I’m finally mastering the gearchange, and my respect for the Alfa has increased significantly. It’s an absolute pleasure to drive on the track, predictable yet exciting, and despite the race cams it pulls cleanly, loudly singing its Latin song. Fantastico! ‘People look at this and think “Oh it’s just an MG” but by the end of the day it’s often the car that they all want another go in,’ says David as he shows us round this understated B Roadster, proudly wearing its works-style glassfibre hardtop. This car shows its race credentials not just in a few light battle scars but in the flimsiness of the lightweight doors and plastic windows, and the rorty exhaust note as the engine fires up. As David goes on to confirm, these seemingly basic FIA-spec MGBs are always much-underrated, and yet it’s a model with Le Mans history and current competiveness in all manner of prestigious international historic motorsport. Of all the cars here, it turns out, it’s the MGB that feels the sportiest just to sit in, because you’re seated low in the cockpit, legs stretched out straight ahead. David jokes that the gearshift requires ‘muscle memory’ because the first-second plane is so close to reverse to the left and to third-fourth to the right. And as with any MGB, the minimal movement from side to side contrasts oddly with the relatively long fore-and-aft of the shift. But it snicks in neatly all the same. The B-series engine is tuned enough to rid it of the unwillingness to rev that defines the standard road car. As a consequence it’s not got a lot of torque low down, but the gear ratios are well-spaced enough for that not to be a problem, and third and fourth are fine for all but the chicane, which needs a quick snick down to second gear. In fact, it couldn’t be easier, even when the rear starts to lose grip a little on Madgwick, because the B’s behaviour is so predictable (in a good way). If there’s any downside to it, it’s that the steering is very heavy, which is a typical MGB trait. It’s mostly due to the unusually high castor angles designed into the MGB’s front suspension, and initially it makes it feel as though the steering is completely dead, until you re-attune to it – and build some forearm muscle. With more time spent in the MGB, it could feasibly become the car I’d be most comfortable in, and perhaps even quickest in, despite the competition. Never under-estimate an MGB. You might be relieved to hear that this isn’t a genuine Lotus Cortina, but a decent replica, built using the conventional rear axle of later MkIs rather than the slightly fragile A-frame system of the first cars. Do we agree? Certainly first impressions are good, sat in that airy cabin, its thin pillars making for superb visibility. The white-painted dashboard adds to the light, bright feel, and who wouldn’t appreciate those four gauge pods spread across the centre of the fascia? This is an iconic machine, or a damned good replica of one at least. The gearshift is typical rear-wheel-drive Ford. Short, precise, wonderfully mechanical without feeling overly notchy. Slot it into first, thumbs up from the pitlane marshals, and we’re off. Immediately it feels completely natural to drive. All the controls matched in weight, all perfectly placed, and within half a lap this feels like The One. At every turn it does exactly what you’d expect it to do, its stiff suspension keeping everything in line. You know it will bounce a little and slide when pushed hard but there’s never a nasty surprise here. The engine revs freely, sounding wonderful as its twin sidedraughts gobble in air, but the revelation is the steering, which is lighter and more precise than any 1960s steering box has a right to be. Downsides? The gearing. It’s so low, which would work fine if it was running a race engine, capable of revving to 7-8000rpm (and needing a rebuild every few races). But with the limiter knocking back the power at 5000, the four-speed Cortina is best kept in top for much of the circuit. David is considering raising the gearing, though the downside might be to lose some of that sweetness of response. In fact, low gearing is a small price to pay for the chance to experience a Lotus Cortina on track, replica or not. What a superb machine. Early short-wheelbase 911s are hugely soughtafter for historic racing and rallying, and of course hugely expensive to match. The 912s look identical, and the smaller, lighter four-cylinder engine makes for much better weight distribution and safer handling, at the cost of losing that six-cylinder wail. This one is currently built to quite a basic specification, and I’ll admit it feels tame compared with most of the others. But the chance to drive an early Porsche round a circuit is not to be sniffed at – and the experience is significantly different from the rest. The gearshift movement is long and rubbery, but it’s never a problem to find the right gear. The accelerator action feels heavy and initially a little awkward, but the clutch, brake and steering are delightfully light and feelsome. In fact, that steering could easily be the best here; on track, it feeds back every undulation, every camber change, in a way that only an early Porsche can. We’re making decent progress, circulating the track smoothly and undramatically, with everything working exactly as it should. The handling feels predictable, none of the famous tail-waywardness showing through at these speeds – and in fact, the 912 is far less prone to that – and the grip through corners is tenacious as long as the car is powered through, keeping weight over the rear. The engine feels strong, unburstable, but undramatic, even when revving hard. And it’s this aural effect, along with the sheer competence of the 912, that makes it perhaps the least exciting of all the cars here – but with more time to explore its abilities, I feel that might change. And now for something completely different… Though just how different the Mini would feel is astonishing. This sounds odd in the extreme. Time to find out. Another airy cabin, this one admittedly rather smaller than the Cortina’s, though the speedometer still feels far, far away in the centre of the dash. The steering wheel, famously, is closer to the horizontal than the vertical plane; since (Mini) time began, the position has been compared with that of a London bus. Still, all else is fine, and everything feels perfectly normal as we pull away down the pitlane and buzz onto the circuit, the little A-series – this one bored out to 1310cc – already revving hard. I have to correct the steering to avoid turning into the kerb, which prompts another larger than expected move across the track. Remember when you first tried a driving game console, and watched your virtual car swing from side to side as your thumb/brain struggled to master the required subtlety of movement? Well that’s how this feels. A few corners in, and it becomes clear. There’s no movement in the suspension, just none at all, and the car’s wheelbase is a mere two metres, and so even the tiniest steering input produces a marked change of direction. Back off the power mid-corner and the rear tyres unload and let go, so the technique is to brake lightly, use the tiniest movement of the steering wheel to turn in, then power through the corner. Seasoned Mini racers will set the car sideways on the entry to the corner and half slide, half bounce through, usually nipping past several cars in the process. However you do it, you can’t fail to have fun. That A-series engine may be basic but it keeps revving away as you tear round the circuit, breathless and giddy from the mix of excitement and hilarity of the Mini driving experience. If you’ve never driven a race-spec Mini on a track before, add it to your bucket list now. Right now. From the sublime… to the Mk2, which it would be tempting to say is as far from the Mini as it’s possible to get, except that the huge Ford Falcon looms large in the distance. Still, the Mk2 provides a remarkable contrast with the Mini, particularly with its opulent interior still intact. ‘It’s the oldest car here,’ says David. ‘In the 1960s, these cars turned up to circuits still with all the leather and walnut. By the mid-1960s, the racers had realised how much was to be gained by losing weight, and they started stripping them out. What’s most apparent, though, is how smooth everything about the Mk2 feels. The way it rides, the quality of the controls, the seamless revving of that wonderful engine, and even the steering. The Mk2 has had little more than the rollcage fitment in terms of track preparation, and yet it sails around the circuit as if it were made for it. Boy does it need some steering input though, especially after the twitchy Mini. The weight of the Mk2 and comparatively soft suspension pushes it into inevitable understeer, and in the tighter turns it’s a challenge to twirl the steering wheel enough to persuade the car through. The Vredestein tyres (this is the only car not on the grippier Avons, in deference to its wire wheels) squeal in protest but it makes it every time, and just hunkers down again out of the corner to power along the straights on its long-legged gearing. No top speed frustrations with this one. So, different from the rest but good fun regardless. And every time I think of it, I’m reminded of that remarkable engine, so wonderfully, effortlessly smooth. Ever used a Hurst shifter? It’s a wonderful thing. Despite the length of the shifter in the Falcon, each gear selects with a short, precise movement, clicking into place, so it would be perfectly feasible to shift between first, second and third. But today, why not make it a bit easier… from Park to Reverse (click) to Neutral (click) and into Drive (click). The V8’s idle drops slightly, the transmission strains to be let off the leash. We’re waved onto the track, and the big Falcon picks up immediately, shifting quickly into second as it powers towards Madgwick. A shove on the brakes (and they really do need a big shove) and a tentative turn into the corner, ready for a rolling, rollicking experience. But no, the Falcon turns in more precisely, and with way less roll than any car weighing one and a half tonnes should ever achieve. In fact, that huge expanse of near-flat bonnet stretching out ahead remains, well, near-flat through the corners, only showing any significant lean through the chicane. Of course, the weight is always apparent, never more so than at Lavant, when an earlier turn-in is needed than for the smaller saloons, and even then the Falcon pushes wide, threatening to run over the kerbing until it powers out the other side, its 302cu-in V8 thundering as it revs out in second gear. And the auto ‘box? Remarkable really. David says that a lot of customers find it a relief to be able to concentrate on the track and on steering the car, rather than worrying about gears, and it’s very easy to see their point. All you need to remember is that the three-speed Borg-Warner won’t shift up if your foot is flat on the accelerator due to the kickdown function (just lift momentarily and it will quickly change up a gear). Sure it would be more fun with a manual, but if hustling a car the size of a small house around a tight English circuit isn’t fun, I’m not sure what is. There was just one disappointment of the day, and that was that we didn’t get to drive the BMW. Fear not, this was only because our day was cut short for the interviews and photoshoot necessary to bring you this very feature, so you’ll get more time. All the same, it’s worth knowing about this car, because it’s a bit special. In the mid-1960s, BMW built homologation specials for touring car racing based around the 1800TI, called the 1800 TI/SA. It had 20bhp extra, thanks to twin Weber carburettors, larger inlet valves, hot camshaft and a higher compression ratio. It was also fitted with a five-speed ZF gearbox in place of the standard car’s four-speeder, uprated suspension and brakes, and a sportier interior. In the hands of Hubert Hahne and Rauno Aaltonen in particular, the TI/SA achieved notable successes. This car isn’t a genuine SA but a replica, good enough to have FIA papers and accurate right down to having the interior painted a different colour (red) from the exterior, just as the works cars were. Wistfully watching the BMW circulate the track as time ticked by, it was clear that it was making swift progress, and all who drove it said how well it performed, though even with the correct dogleg-first ZF gearbox the low overall gearing meant that it was hitting the revlimiter on the Lavant Straight. If you’re lucky enough to sample the Goodwood Revival Experience, be sure not to overlook the apparently humble BMW – it may well surprise you.